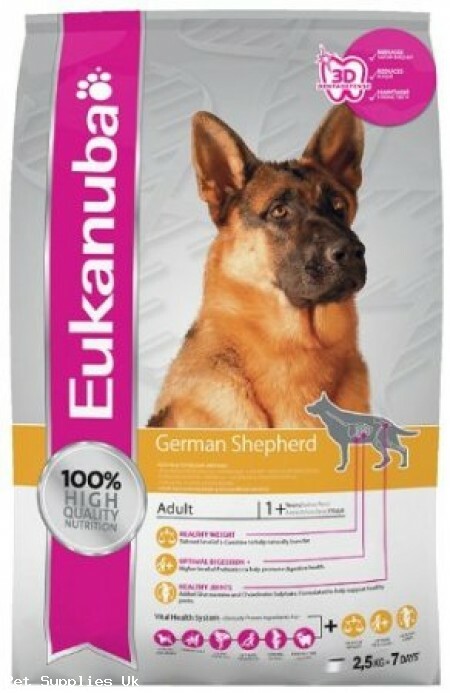 Eukanuba German Shepherd is a complete and balanced daily food made with animal-based protein. It is designed to help promote healthy digestion, firm stools, help burn fat to help control weight and help keep the joints healthy. Eukanuba German Shepherd has tailored levels of L-Carnitine to help naturally burn fat. Eukanuba German Shepherd has a higher level of prebiotics to help promote digestive health. Eukanuba German Shepherd contains added Glucosamine and Chondroitin Sulphate to help support healthy joints. [Eukanuba's DentaDefense HMP system offers a dual action cleaning benefit. During his meal, crunchy kibble helps remove deposits from your dog's teeth. After he eats, special minerals keep tartar-forming materials from attaching to his teeth. In fact, Eukanuba's DentaDefense system is clinically proven to reduce tartar build-up by an impressive 55%. Which is a good thing, because by the age of three, almost 85% of dogs show signs of dental/oral issues. German Shepherds are lively and alert large breed dogs that are always keen to please their owner. In order to maintain good digestion and long term agility they may benefit from special nutritional care.Eukanuba German Shepherd is a complete and balanced daily food designed to promote healthy digestion, firm stools and long term agility.